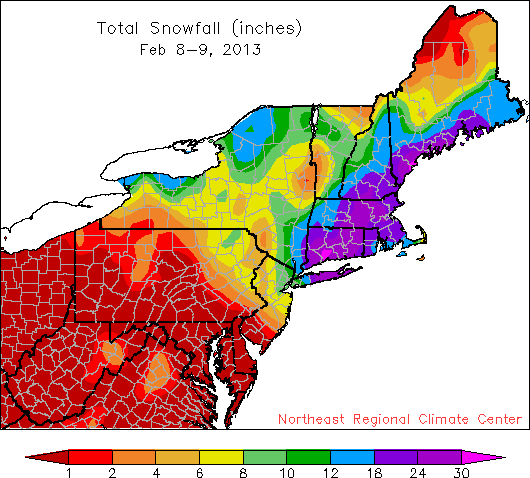 Parts of the Northeast saw more than 3 feet of snow during the record-setting Feb 8-9 blizzard. The major winter storm that impacted areas of the Northeast in February may be a distant memory now that we are well into spring, but that storm is making history. The State Climate Extremes Committee recently approved a new all-time snowfall record for the state of Connecticut. An official Cooperative Observer station in Ansonia, CT received 36 inches of snow in 24-hours from February 8-9, 2013! This breaks the previous record of 30 inches on February 10, 1969 at Falls Village, CT. The committee examined the observation site and methods used before approving the new record. View the report online.